My design was selected to be a part of the Town of Montague's Centennial Art Trail here on Prince Edward Island, Canada. The piece is located right before the bridge over the Montague River, so I wanted it to celebrate the natural landscape of the waterfront. I wanted it to almost blend in with the environment so rich in greens and blues (in the summer anyhow!). Ready to be installed on to the fence. To create the image, I took a photo of a crashing wave and opened it in Adobe Photoshop. I altered the image to enhance the pixels, creating distinct blocks of colour. Original hand drawn sketch on paper. From that image, I grouped similar colours together so that I wasn't working with individual colours specific to each block. The image was further blurred in this process. The photoshop pixel map Heather worked up with colours grouped together. The wood blocks were made entirely out of 2x4s collected from this collapsed community hockey rink located on our property. The quonset style building was built in the late 1960s by the church down the road. Much of the wood was likely locally harvested and milled on site. I listened to podcasts while I sanded in our sunroom which was also made from wood and windows that were in the rink before it collapsed. I listened to Stuff You Should Know and Canadian True Crime (not for everyone!) podcasts. 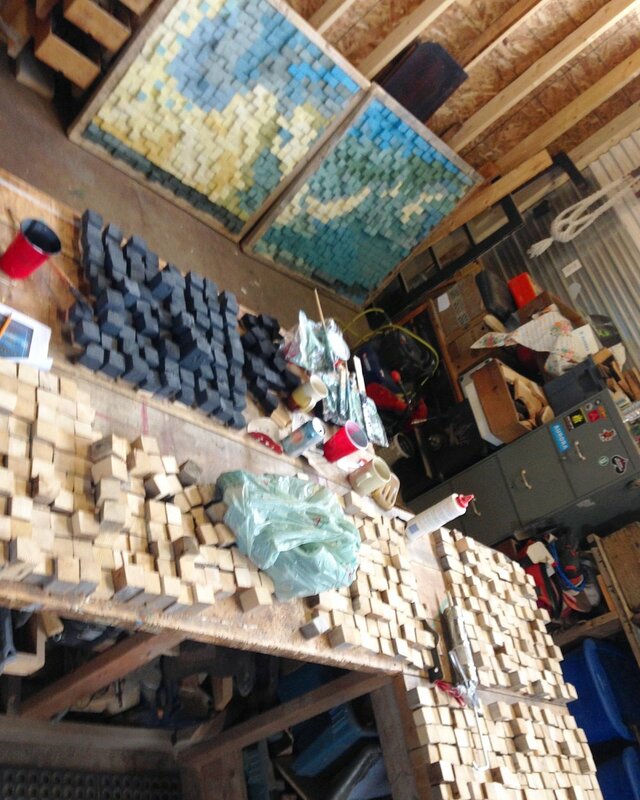 We are grateful to our friends who actually seemed to enjoy sanding hundreds of blocks with us on their weekends! Thank you so much to Dennis and Heather, Jay and Angela! And Lenny's Mom helped too! Our friend Jay painting shades of seafoam. There were blocks friggin everywhere when we got to the point of putting it all together. Managing different colours and the amount needed of each colour got a little tricky here. Our dog, Timber, likes to take chunks of wood to chew on AND we had little kids come and visit us - this meant that we were finding blocks in random places (in kitchen cupboards, on bookshelves, under the couch) weeks after the piece was installed! I did adjust some colours after they were glued up because they didn't look right. (The computer can make a bluish-yellow colour - physically mixing those turns...you guessed it = green.). The studio was pretty block-swamped for a few weeks. Install day always gives you a little adrenaline rush and who knows what other hormones with all of those feelings of pride, anxiety, relief, and accomplishment in the mix. It went really smoothly with Lenny's help (when levelling, he's a very talented by eye guy!). And now it is up! It is much different than I visualized in my head: the colour blocking turned out way looser than I expected. It also had to be in completed in four separate pieces due to the sections of the fence and they had to be spaced to allow for the centre gate to open. Framing each piece wasn't in the original plan, but Lenny suggested it and I am so glad he did. I love the end result and am so happy with the culmination of this group effort. My favourite aspects are how prominent the colours change from the left to right, light to dark. I also love how much the visual changes from far away and up close. Working with colour was new to us, which was fun, but I almost wish I had integrated more bare wood into the design. Oh well, perhaps age and weathering will do that for me. Thank you to Lenny for his artistic opinions throughout, cutting all those blocks, putting the beast together and getting it up on that fence. Thank you to our friends for the power of time travel. We lost huge gaps of time laughing while working and made that sanding job feel like it flew by on block party days. And thank you to the Town of Montague for the strategic effort to add arts & culture to the community. If you have any questions about the process, ask away!